At Parkside we are proud of our strong primary links. We have teachers who visit primary schools to support staff and enhance pupils learning as well as many events which involve primary pupils on site. We have an extensive ‘Multi-skills’ programme for year 5 pupils. All our feeder primary schools are invited to experience a plethora of activities which not only support their learning in year 5 but also extend their higher level thinking ready for the challenges of year 6. We have a dedicated team of year 8 pupil leaders who support and look after the year 5 pupils when they are with us. Pupils in year 5 quickly develop positive relationships with year 8 as they are great role models. Multi-skills weeks are an ideal time for pupils to learn more about the school, meet staff and familiarise themselves with the day to day running of a successful school. This hopefully reduces the anxiety and worry for pupils during their transition when joining us in year 7. 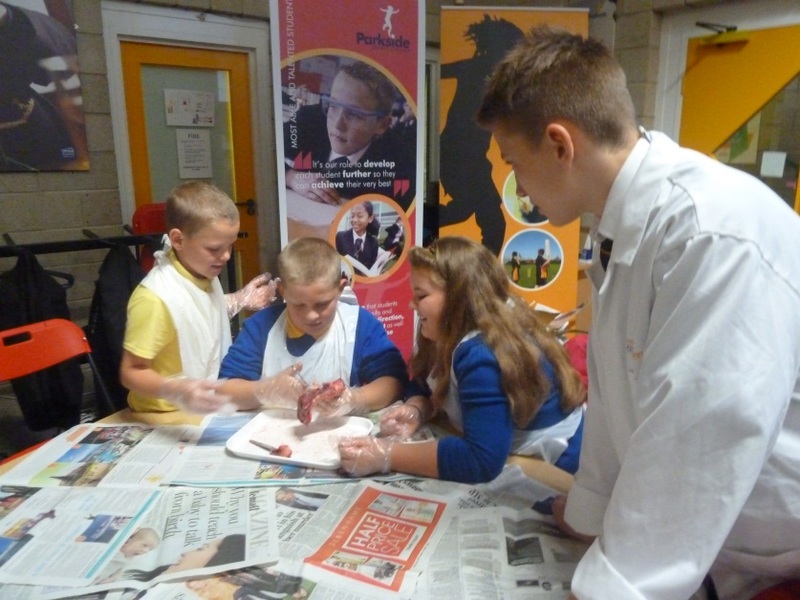 Pupils take part in several ‘STEM’ days as well as a ‘Maths Challenge’ day. We have a dedicated team of year 9 reading mentors who work with primary pupils to encourage reading and develop their love of books and all things literary. We have extended the use of our facilities and invited all primaries to our ‘after school’ activities led by our staff and sports leaders. It important that our pupils at Parkside are involved in our work with primary schools and currently have over 20 pupil leaders involved in liaison work – many of them leading activities during and after school for primary age children. We feel our work with year 5 pupils is a vital aspect of life at Parkside as we want students to make the right choice and join us in year 7. As pupils spend several days with us over the year they become more relaxed and at home with us. This in turn makes their transition less worrying for both parents and pupils. We have had fantastic feedback from parents, pupils and teachers after pupils have spent time with us. As a school, we are committed to continuing to build on our positive relationships with our primary feeder schools and invite pupils to join us even more over the coming months and years.